Creating quality content is the heart of content marketing. Relevant, valuable content is what will make your audience stop to think and behave differently. This kind of positive engagement is what separates content marketing from traditional marketing. There must be a purpose to content creation; a goal. Creating content for the sake of creating content is a waste of your readers time and yours. Your content marketing goal should align with your overall marketing goals. If someone emailed you the content you just created, would you be grateful? Does your content have any sentiment or piece of information you would repeat while out socializing with your friends? If your content doesn't meet either of those, maybe you should revisit it. There is so much information out on the internet, readers aren't going to just be looking for a reason to kill some time on your page. If you are struggling to come up with some original content, shed some new light on a popular subject. If you've got a successful business, you likely have something that makes you different. Use this knowledge and personality to differentiate your content as well. Creating content isn't the only way to provide your audience with valuable information and resources. You can become a source for industry news and tips from others as well, through content curation. Mark Sherbin says to be the "go-to feed for audience members interested in your topic" in his article Should You Curate Content? The Essentials Every Content Marketer Needs to Consider. Part of content curation is providing extra value to the content. It could be as simple as providing key points for those who don't have time to read through the whole article or taking a fresh look on the topic. When you are sharing others content, you must make sure you are giving credit to where credit is due. Including snippets in a blog with credit or re-Tweeting is a nice way to curate content. When you are sharing others content and giving them credit, you are creating a good opportunity to build a mutually beneficial relationship. They might start sharing your content with their audience which helps expand your efforts. Save your audience time by giving them one location to find all of the news they want to see in one location. They don't have to comb through numerous sources, you've already done that for them. Be thoughtful on the content you curate, sharing too much unwanted content isn't beneficial. Get your content seen. It can be difficult, at first, to develop a following. People aren't going to just search out what you have to say. You've got to start by having quality content. Then you share it wherever you can. The more places you share your content, the more opportunities people have to find it. Your blog is one obvious place to start sharing content. Your social networks are another great place to share content. Each network has a different emphasis which allows you to share content in different ways. You finished up an article and feel really good about it. You shared via your social channels but did not get the response you hoped for. Now you are wondering, did I share it at the right time? Should I have shared it with different messaging? Don't worry, it's a good practice to share your content multiple times. Experiment with what times are best to share and what messaging best resonates with your audience. Your content doesn't need to be held to just one format. What may be a great step by step instructional slide presentation could make a great video or blog as well. People have preferences on how they like to consume information. This also helps you produce more content without requiring as much of your time. 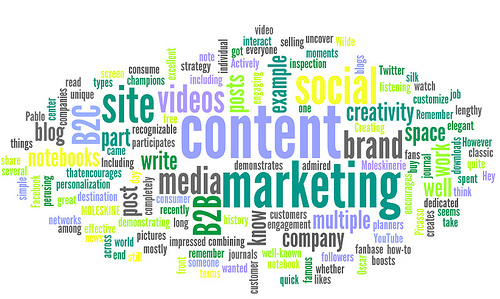 If you're looking to build more content in your marketing plan for 2014, just remember the three C's. Nate Holmes is the marketing coordinator for Smartimage, a brand of Widen Enterprises.